Baby corn, young corn, or cornlettes, is a cereal again taken from corn (maize) harvested early while they are very small and immature. It typically is eaten whole-cob included, in contrast to mature corn, whose cob is too tough for human consumption. Baby corn is eaten both raw and cooked. Baby corn is most common in Asian cuisine. In thai cookbooks, it is referred to a candle corn. 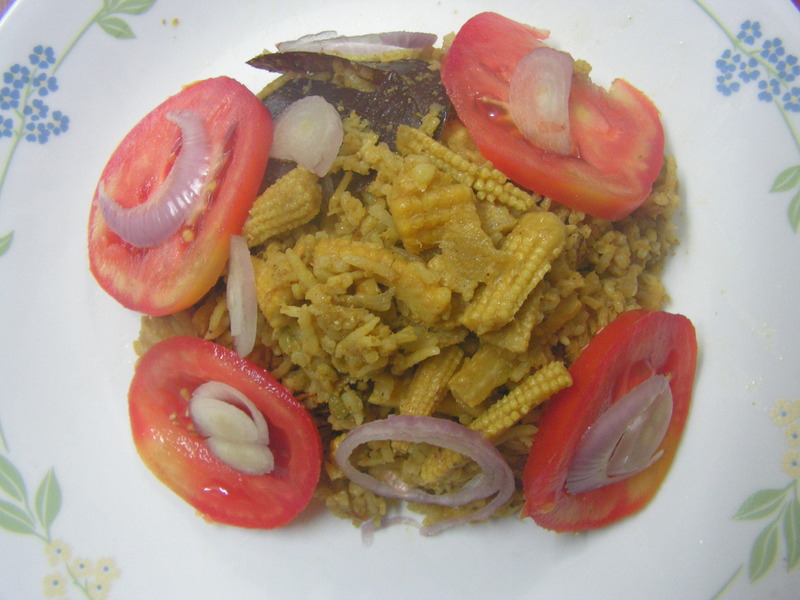 Now-a-days baby corn is so popular that we use it in various dishes like the salads, baby corn frys, stir frys, baby corn masala and today I would like to put up baby corn pulav which is so easy and tasty too. 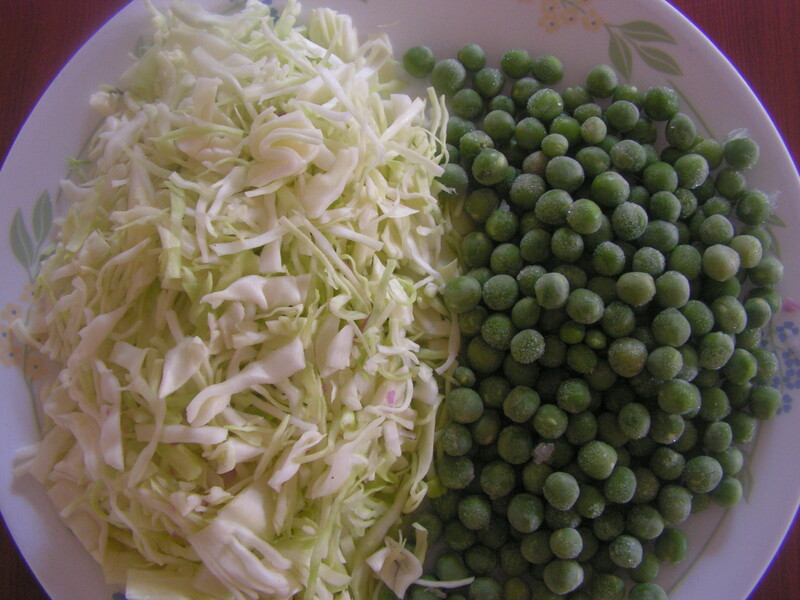 I have not used many veggies other than the green peas. Here it goes!!!! 1. 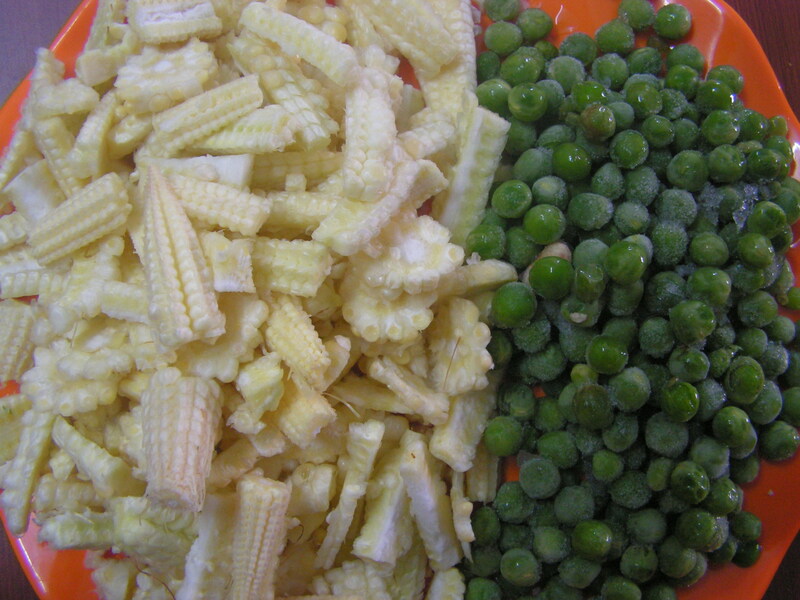 Wash and chop baby corn into lengthwise pieces and keep it aside along with green peas as shown in image 1. 2. Place a cooker with 2 tablespoons of cooking oil in it on medium flame. On heating add Tej patha/masala patha to it. When a pleasant aroma oozes out, add cashews and fry it. Add chopped onions and required quantity of salt to it and fry till transparent. 3. In the mean time grind all the ingredients of wet masala in the mixer to a fine consistency. 4. 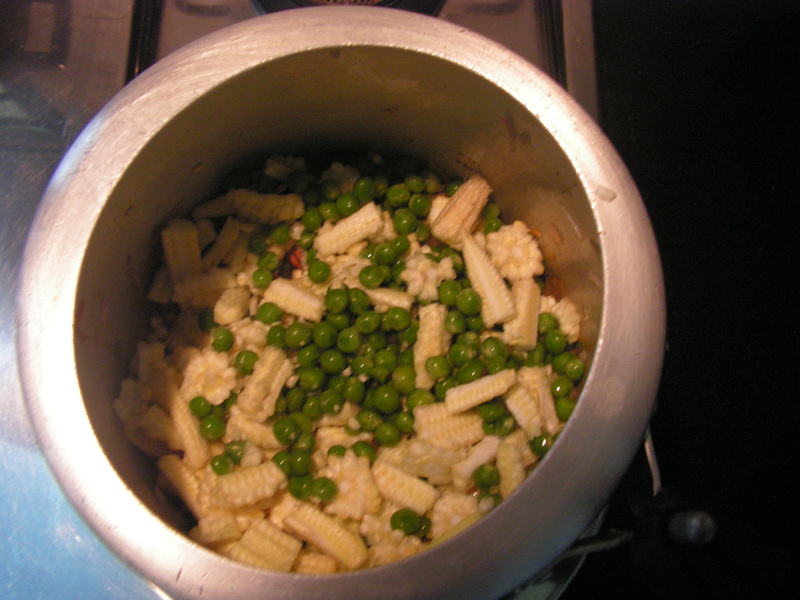 When onions are fried to transparent, add chopped baby corn and green peas to it and just give a stir . 5. Once done, add grind wet masala from step-3 to it and stir into it . 6. 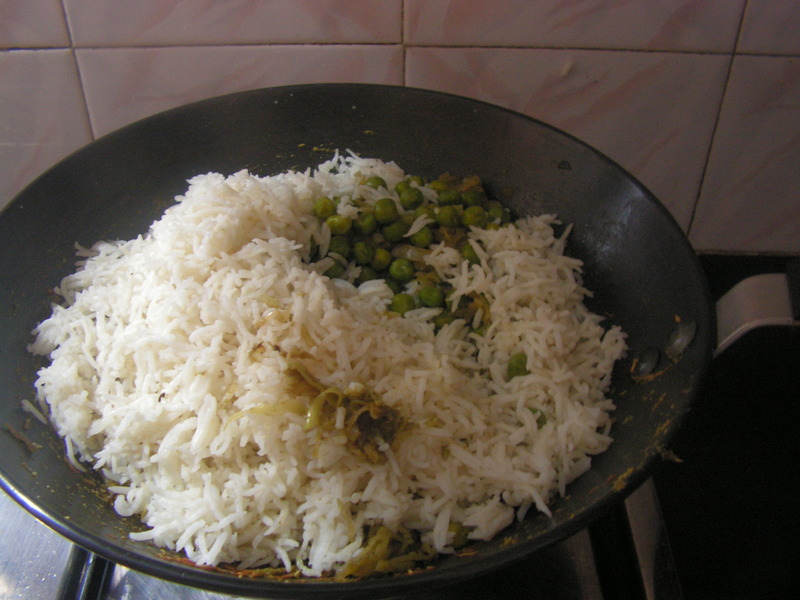 Once done, add soaked, strained basmati rice to it. Add coconut milk and the remaining(required quantity ) water to it and closing the lid of the cooker and cook for about 20 minutes on simmering the flame. 1. One need to use basumati rice for best results. 2. You can even use any other veggies of your choice for the dish. 3. One can even avoid coconut milk if not needed. 4. 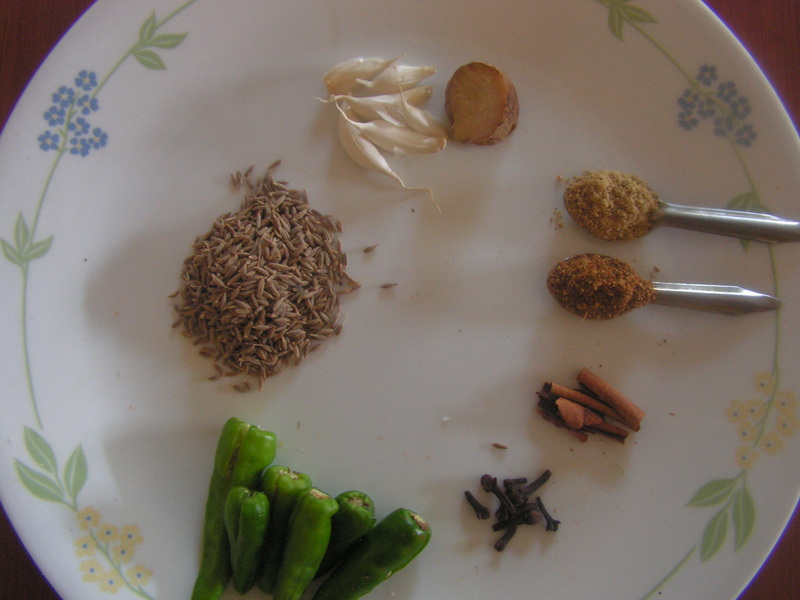 You may have to add more of garam masala powder since the powder I have used is very strong. This entry was posted in Uncategorized and tagged Baby corn dish, One pot meals, Party dish, Rice items. Mushrooms now play a vital role in the menu even among the vegetarian few. I have already put up mushroom masala, mushroom in coconut gravy, and today I am putting up this one pot meal version – mushroom fried rice. I make this mild, and have a gravy side dish like Vegetable Kurm to turn up the spice levels! 1. 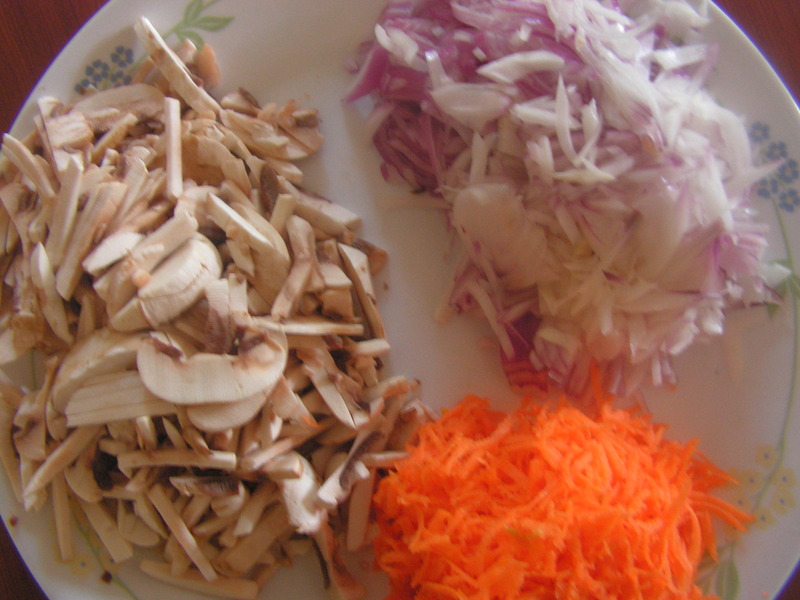 Wash, peel and chop onions lengthwise, wash, peel and grate carrots, also wash and chop mushrooms too and keep it aside as shown above. Wash and drain water from rice and cook it in the cooker as usual till done. On releasing of pressure allow rice corns to cool as shown above. 3. 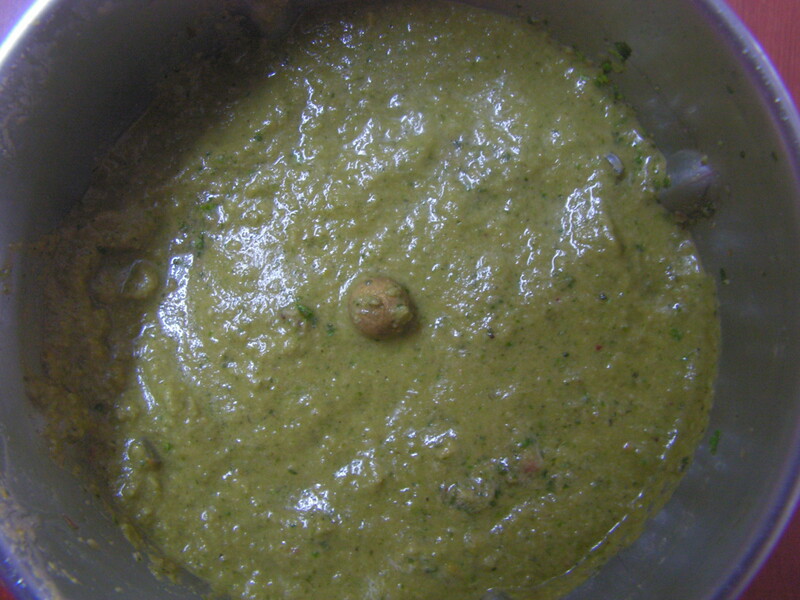 When fried, add ginger-garlic paste and slit green chili to it and give a stir. 4. While being done, add chopped onions and salt required for the dish to it and give a stir at regular intervals so that the onions turn transparent. 5. 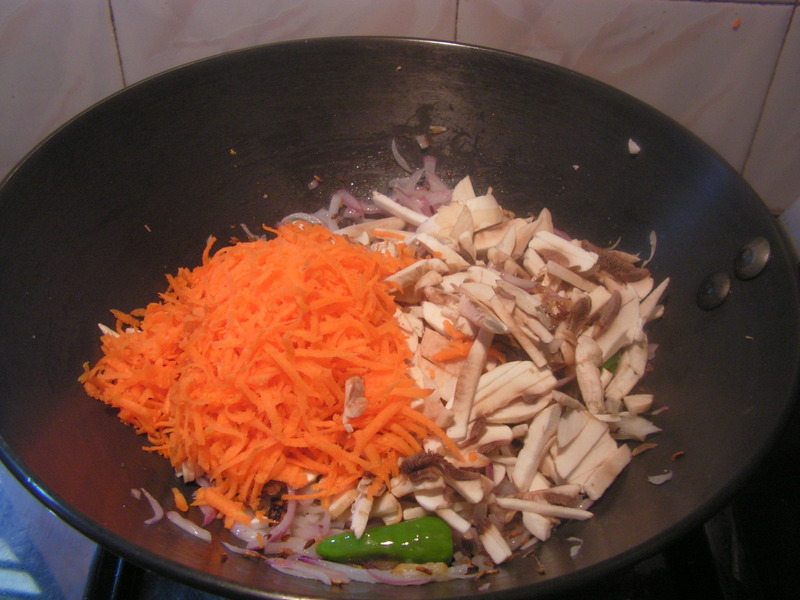 When done add chopped mushroom and grated carrots from step 1 and cook till done with a lid on top. 6. Add all powders as the veggies are cooked and stir well. 1. Cook rice corns in such a way that each grain is separate. 2. If needed garnish with chopped cilantro. 3. One can even use tender french beans, green peas etc. if necessary. 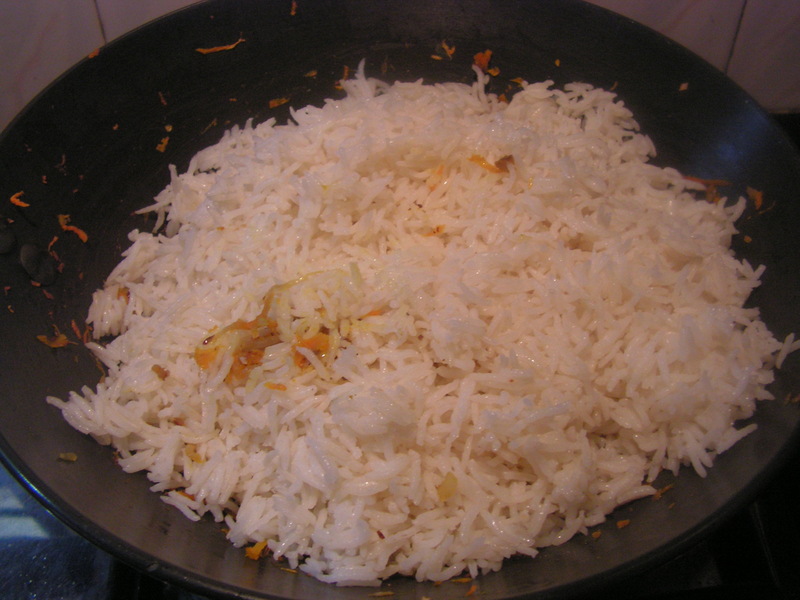 This entry was posted in Uncategorized and tagged One pot meals, Rice items. 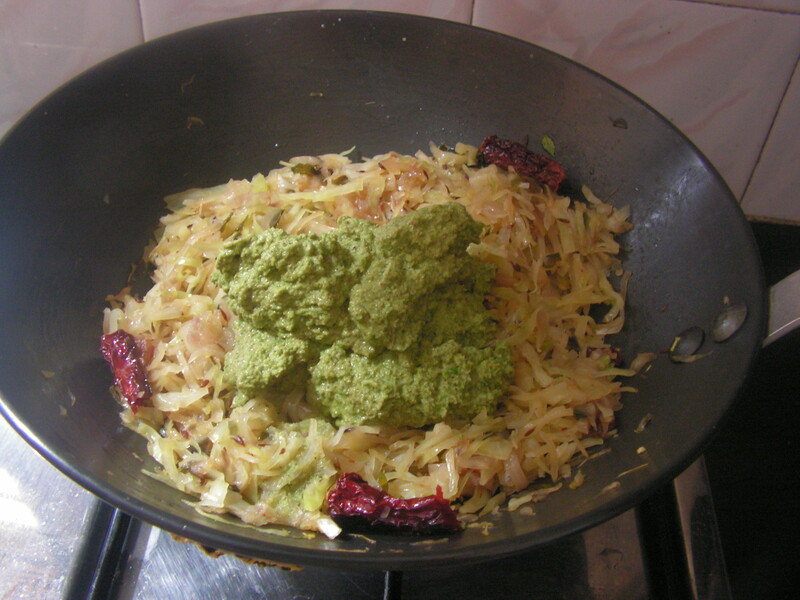 Cabbage/Kosgadde in english and kannada respectively is used in a number of dishes. I have already put up Cabbage Bhuthi, Cabbage Sanna polo and Cabbage Paratha. This recipe today is for the Cabbage rice, a great combination with either tomato salad or just like that. 1. Wash and peal onions lengthwise. Wash and chop cabbage fine and keep it aside. 2. Cook green peas in cooker adding a little salt till soft. 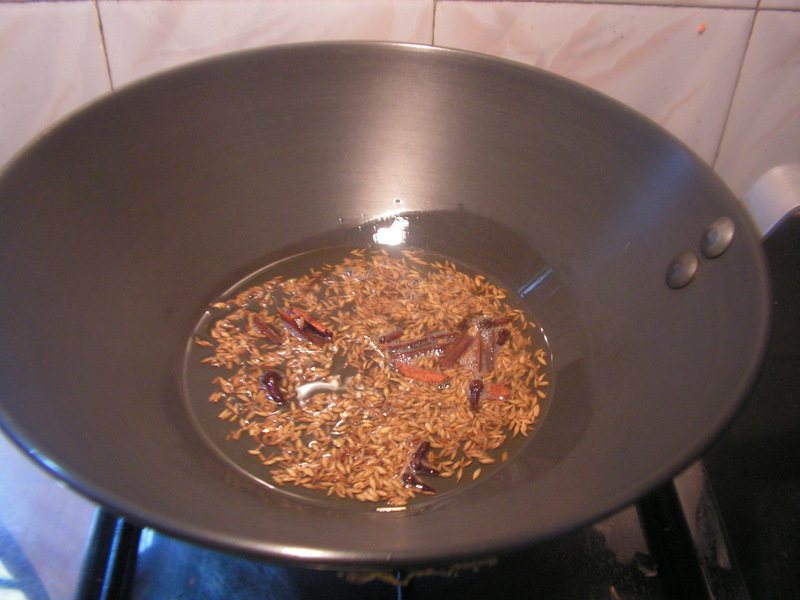 Also later on cook basumati rice in the cooker in such a way that each grains are separated rather than sticky. Let the cooked rice cool down. 3. Place a skillet with 3-4 teaspoons of cooking oil in it on medium flame. On heating add cumin seeds to it. When it splutters add raisins, red chilli pieces and curry leaves. When fried add chopped onions and required quantity of salt to the dish and fry till transparent. 4. 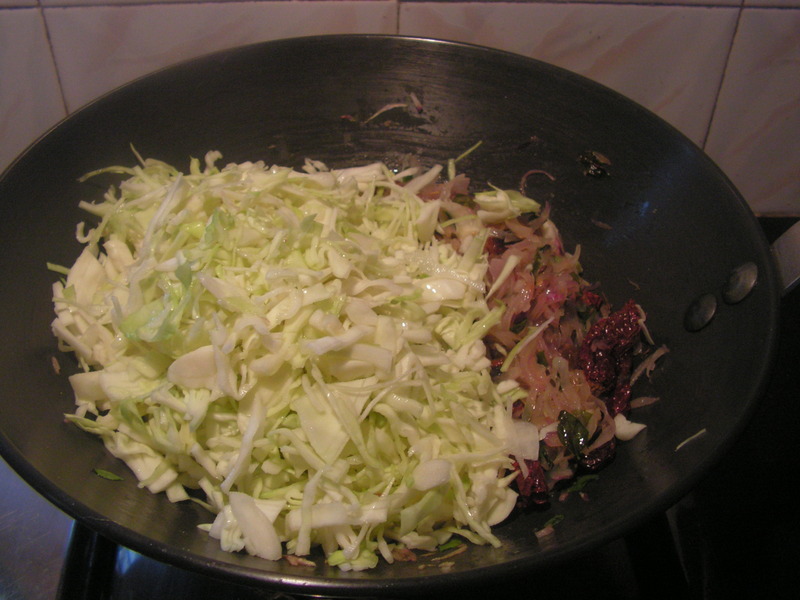 When onions is fried and transparent add chopped cabbage from step 1 to it and close it with a lid till it turns soft and cooked. 5. 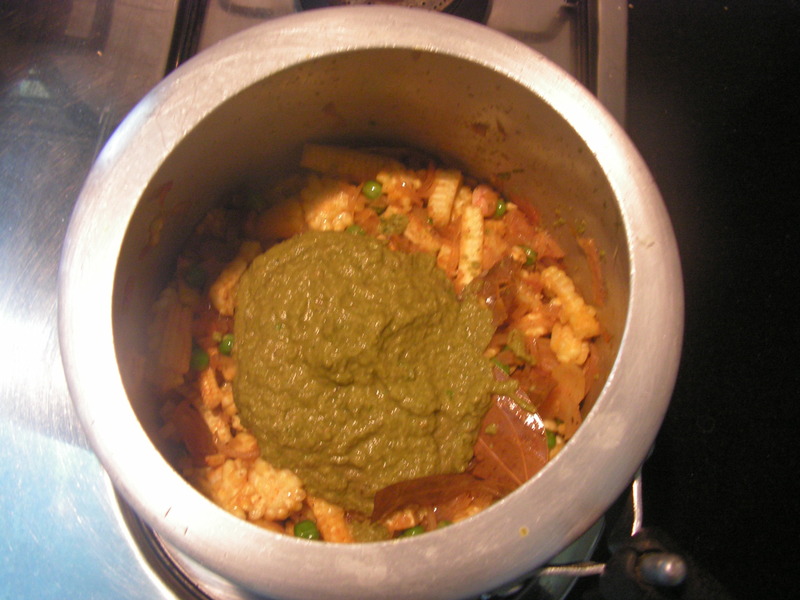 Grind all ingredients of wet masala in the mixer to a fine but thick consistency adding a water in steps. 6. When cabbage is cooked and also the wet masala from step 5 to it. 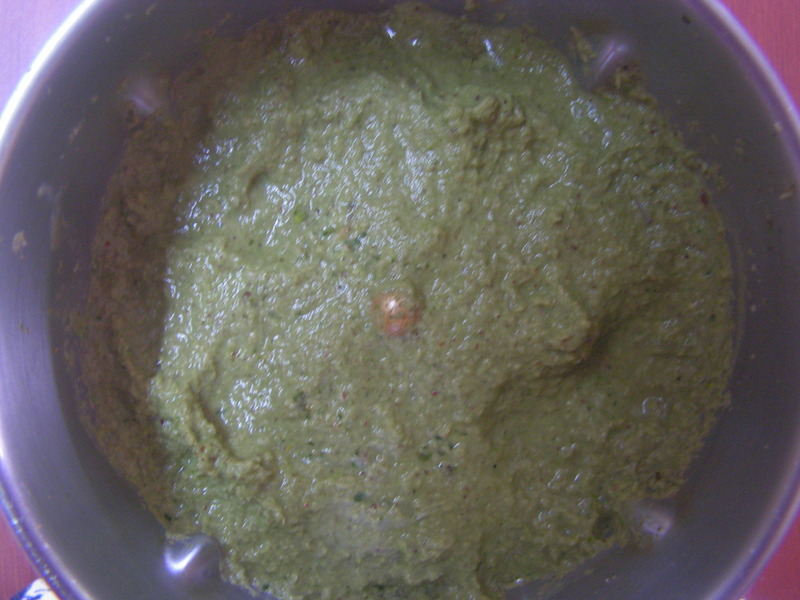 On mixing add cooked green peas too to it. Add cooked rice from step 2 to it and give a stir with a wooden spatula checking for salt. 7. Transfer it to a serving plate and enjoy it with a dash of tomato sauce or a salad. 1. 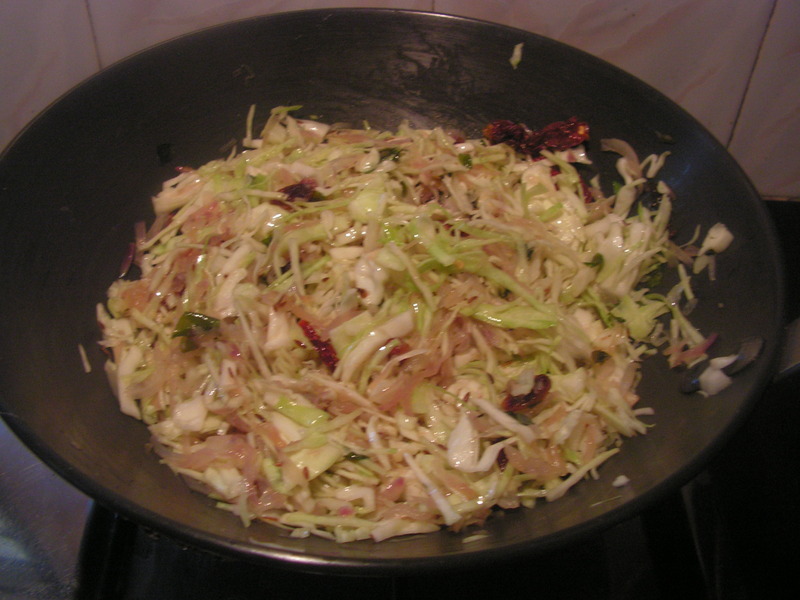 Use fresh and tender cabbage for the dish also chop it fine. 2. Cook rice in such a way that each grain is separate and not over cooked. Always use a wooden spatula to mix the masala finally so that it does not get crushed and turn soggy. 3. Using mint leaves is an option. This entry was posted in Uncategorized and tagged Lunch box, One pot meals, Rice items. This one is Drumstick /Nugge/Mashingasanga in English, Kannada and konkani respectively. This vegetable is somewhat unique and not the most versatile. However, it goes selectively into dishes providing a provides a special something to the flavor of the dish. It is a good combination with Egg plant, and also the popular South Indian Sambar! In this post however, I am using the greens of this vegetable ( see photo below) as the main source of flavor in this rice dish. 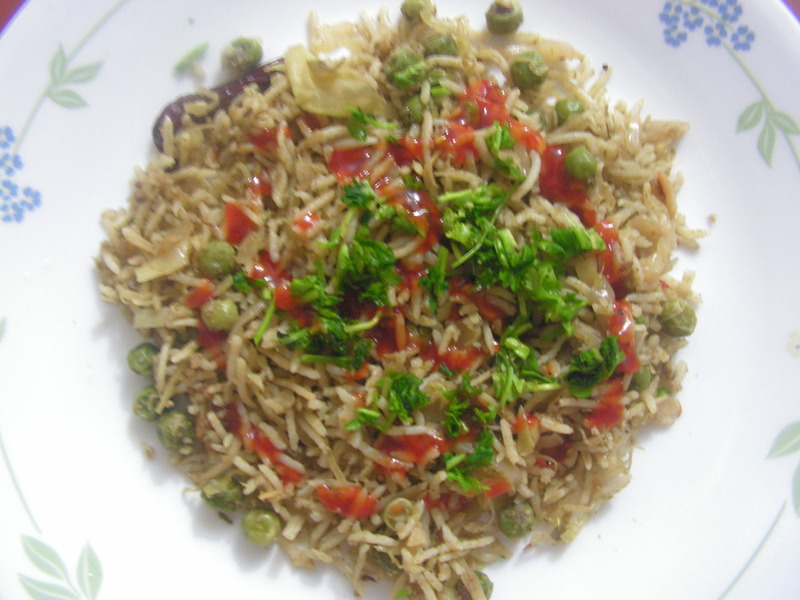 You can think of dish as a variation of the more popular Methi pulav – both the leaves by themselves are a bit bitter but makes for a great pulav nevertheless. 1. Wash and drain water from Basumati rice and keep aside. 2. Wash and chop Capsicum and remove the ridges of the gourd and chop. 3. Wash, peal and chop onions lengthwise. Chop tomatoes and cashews. 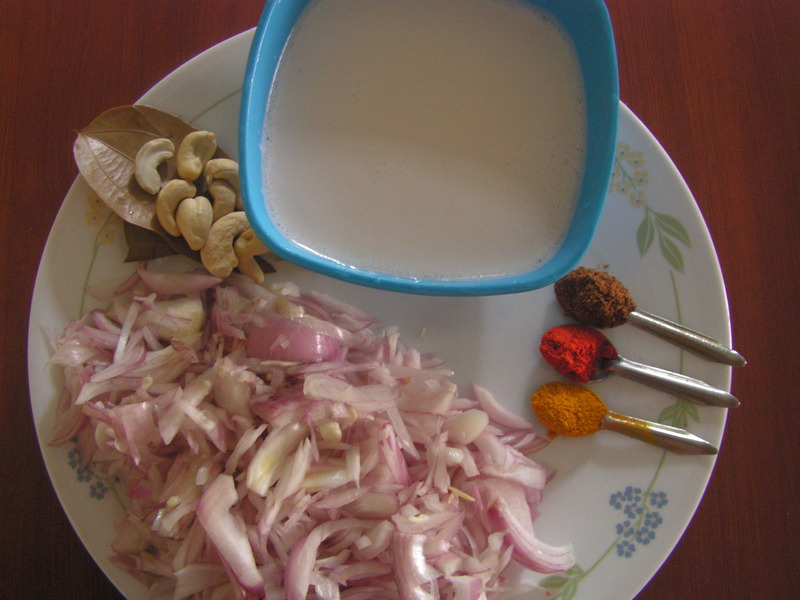 Also extract coconut milk from fresh grated coconut. 4. Place a cooker with 2 tablespoons of cooking oil in it on medium flame. When heated add cumin seeds to it. When it splutters, add chopped tomatoes and fry till done. 8. Finally add Basumati rice to it and just fry for a minute. Add coconut milk and water to the dish. Check for salt and close the lid of the cooker and cook for about 20 minutes. 1. Tender Drumstick greens is the best option ofor this dish. 2. Veggies like French Beans too can be used . 3. Both thick and the second light coconut milk also can be used. 1. 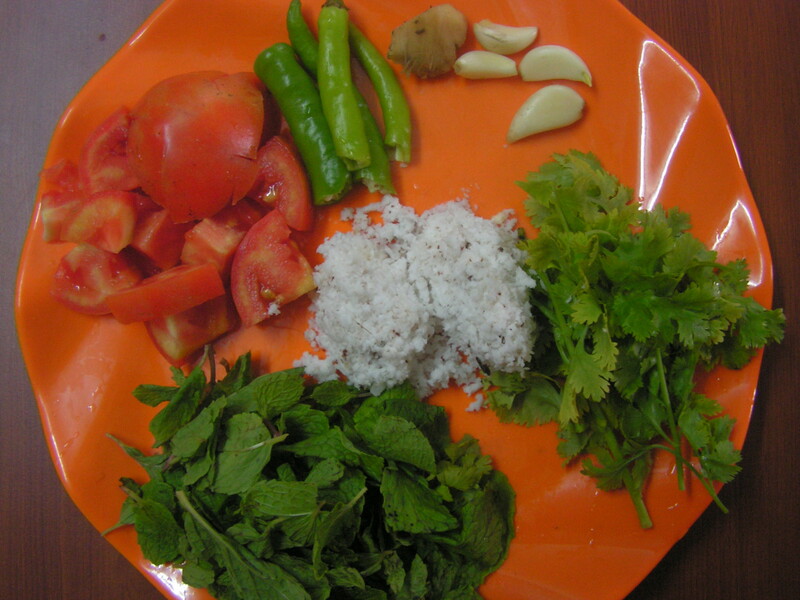 Wash, drain water from rice and spread it on a plate as shown in Image-1. 2. 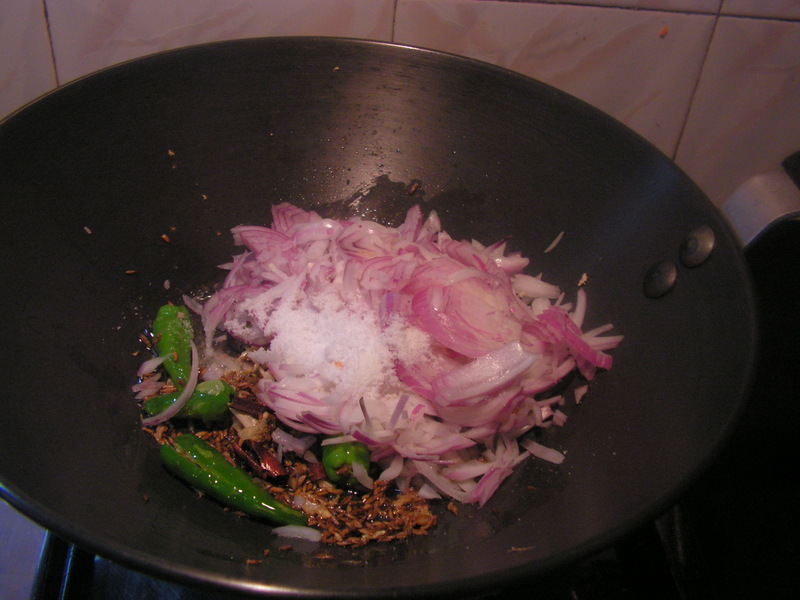 Wash and chop capsicum, onions, mushroom and keep it aside as shown in Image 2. 3. Slice almonds, peel and slice garlic cloves too and keep aside. 4. 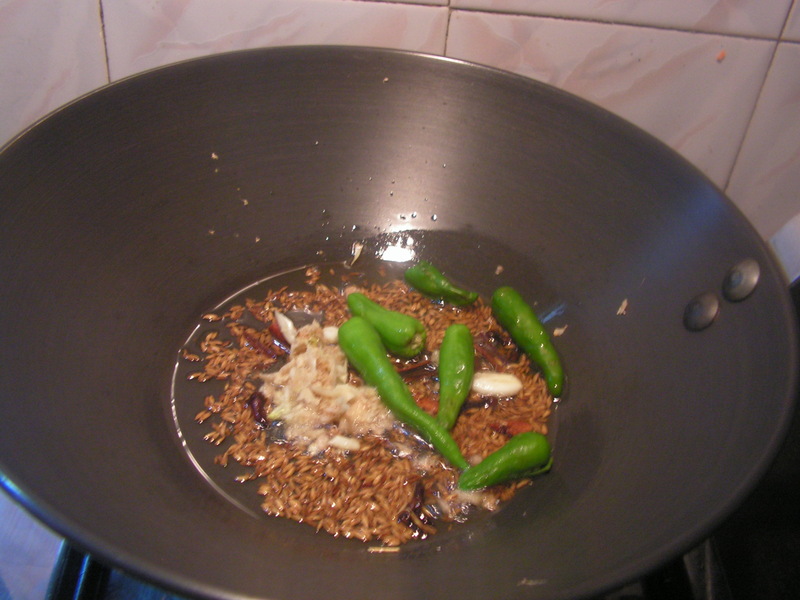 Place a spatula with a little cooking oil in it on low flame and fry diced almonds in it till done. 5. Place a cooker with 4-5 Teaspoons of cooking oil on medium flame. When hot, add jeera/cumin seeds to it. When it splutters, add sliced garlic pods and fry till done. 6. 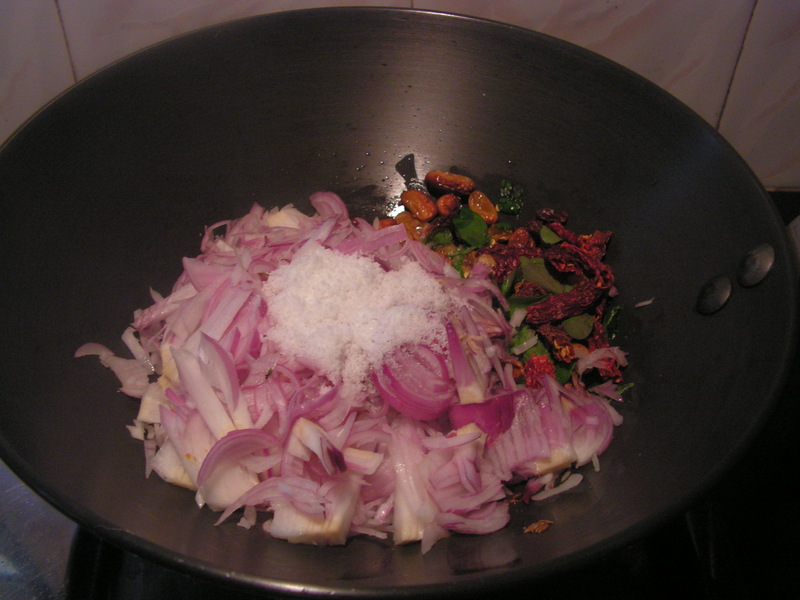 When done, add raisins and chopped onions and fry till onions are transparent. Adding some salt prevents the frying onions from getting burnt. 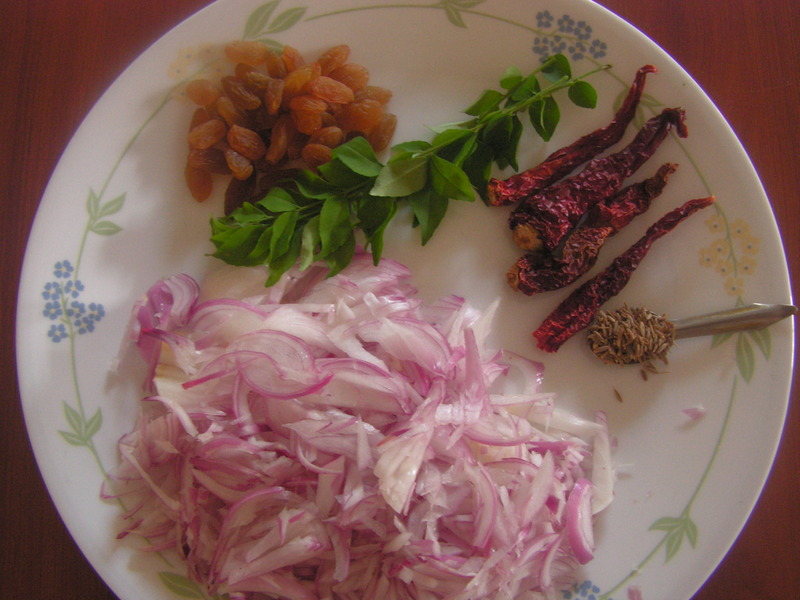 When onions are fried transparent, add chopped capsicum and saute for a while. 7. Finally add chopped mushroom and rice and fry for a while. Add half the quantity of Almonds as well and also add 1/3 cup of coconut milk and remaining quantity of water and cook till done. Sprinkle 1/2 teaspoon of pepper powder while cooking. 8. Pressure cook the rice / cook it until done. Decorate it with remaing quantity of fried Almonds, lemon juice and a little pepper powder and enjoy either plain or with a spicy dish or raita. 1. Use fresh mushrooms for the dish. 2. Pepper powder is optional. 3. A dash of lemon juice gives a unique flavour to the dish. This entry was posted in Uncategorized and tagged Mushroom dishes, One hour, One pot meals, Rice items. 1. Wash Toor dal and soak it for 15 minutes till you cut all the veggies in the cooker adding around 2 cups of water. Add a pinch of Turmeric powder and 1/2 Teaspoon of cooking oil as well to it. 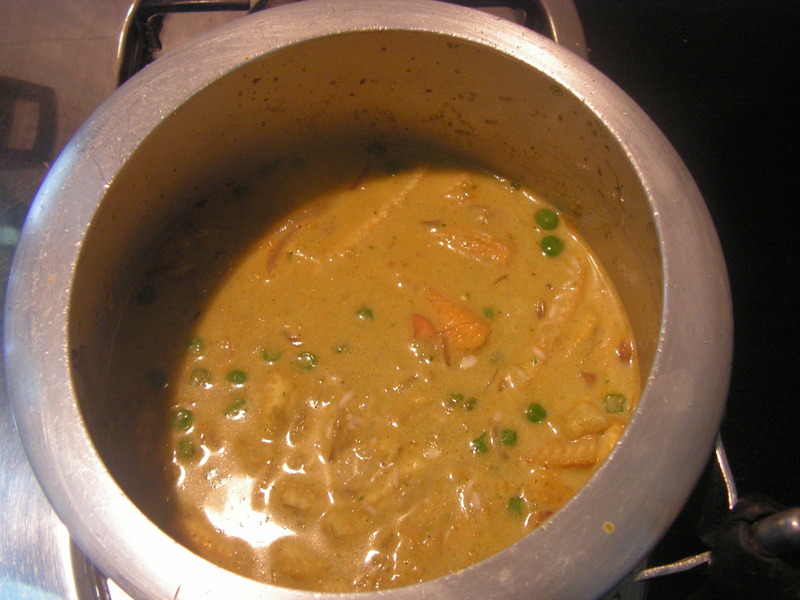 (The reason for adding cooking oil is for the dal to cook well). 2. Wash and chop all the vegetables of your choice. The most important of them being French Beans, Radish, Potato, Brinjal Onion, Carrots, Tomato, Drumstick. (Drumstick to be cooked directly in a different vessel and mixed subsequently). 3. Place the cooker with dal and the chopped veggies from step-2 on medium flame and cook it till done for about 25-30 minutes adding a little salt so that it is no over cooked. 10. Bilimbi or Tamarind – 4 or a small piece of it. 4. Place a spatula with 4 teaspoons of cooking oil in it on medium flame. On being heated add Bengalgram dal, Blackgram dal and fry for a while. When done, add Coriander seeds, Cumin seeds, Fenugreek seeds, Asafoetida, Pepper, Mustard seeds at once and stir into it. Finally add Red chillies and Turmeric powder and turn off the flame. On cooling, grind it in the mixer adding either Bilimbi or Tamarind and water in steps to a medium thick consistency. 5. 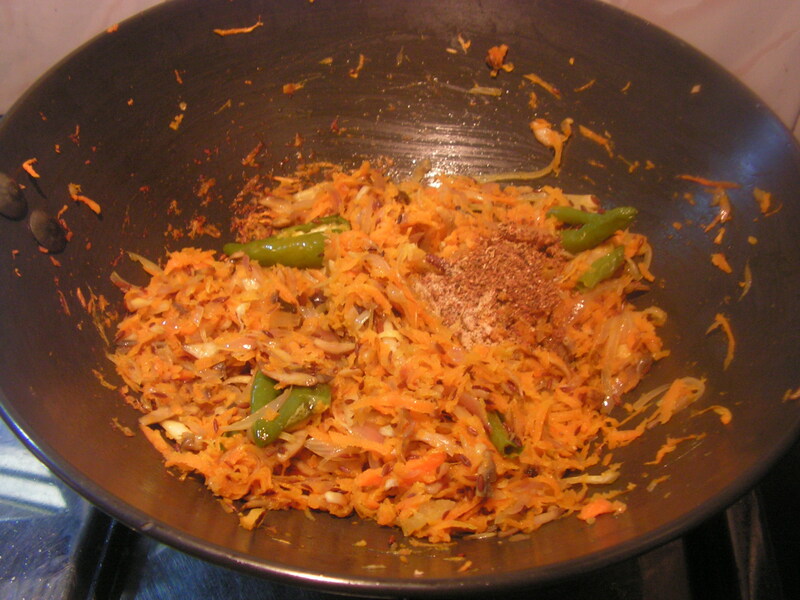 Transfer cooked veggies from the cooker to a broad based bowl and add the ground wet masala from step-4 to it. Add required quantity of water to bring it to the required consistency and check for salt stiring consistently. Finally add chopped coriander leaves . 6. Place a spatula with 2 teaspoons of cooking oil on medium flame. When hot, add mustard seeds to it. When it splutters add red chilli pieces and a pinch of Asafoetida powder and finally curry leaves to it. Switch off the flame and season it to the dish. 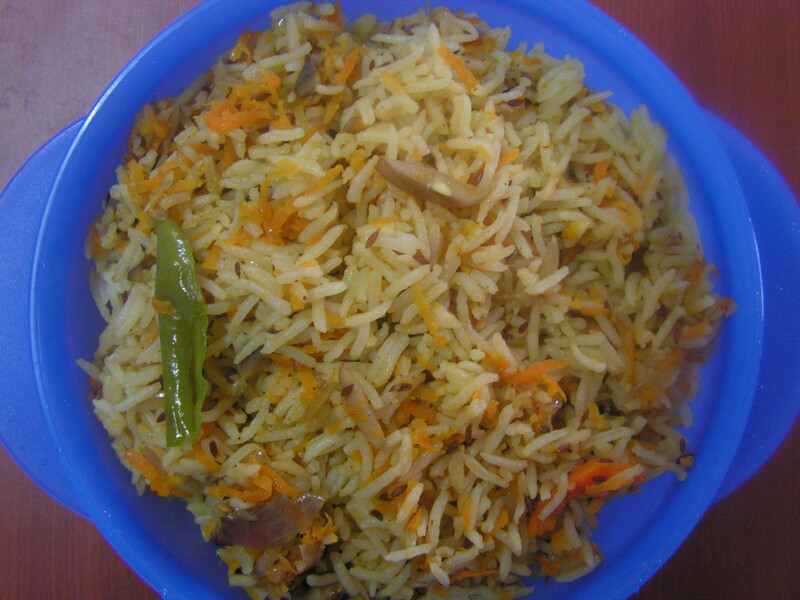 Enjoy with papad and rice, Yummmmmmmmmmmmm! 1. Use quality Toor dal for best flavour and colour. 2. Veggies of your choice can be used. But for Drumstick, cook it in a seperate bowl to avoid it from getting over cooked. 3. Tamarind pulp/dry can be used instead of Bilimbi. 4. Adjust the ingredients as per the required quantity. 5. Chilly should be adjusted as per one’s palate. This entry was posted in Uncategorized and tagged Dosa hut, Lunch side dish, One hour, Rice items. This time, I though of putting up something different and experimental. This Mexican Rice should have been a non-veg recipe, since I am a vegetarian I have just omitted the non veg part of it to convert it into a veggie recipe. I hope the viewers would not object for the same and would respond positively for the same. Just like Indian-Chinese, I have taken the liberty of this Indianized Mexican dish, hope you enjoy it. It is usually a bland dish, so my advice would be to make a side dish along with it. Here it is. 1. 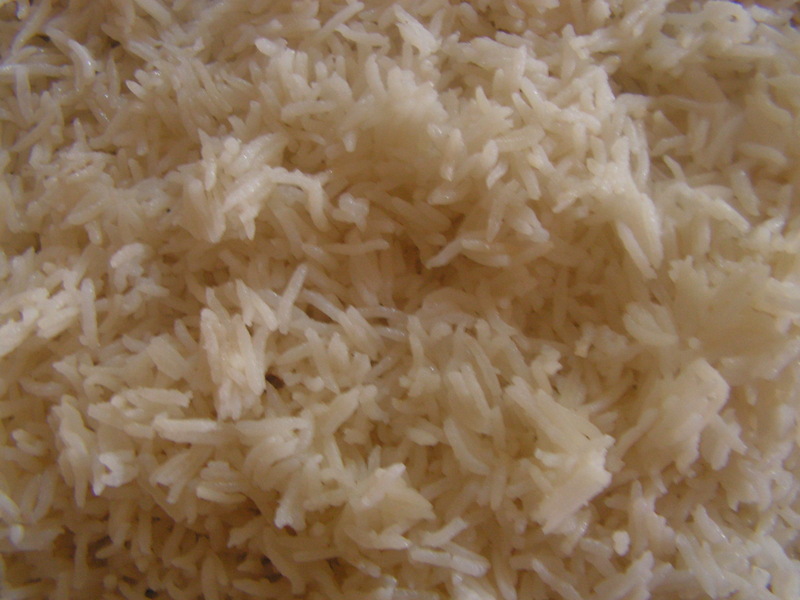 Wash Basmati rice, drain water, and keep it aside in a plate so that it is ready to cook. 2. Wash, peel and chop onions as required and keep it aside. Wash and chop bell peppers too and keep aside. Chop cilantro too fine. 3. Place cooker with cooking oil in it on medium flame. When hot, add Just crushed Garlic cloves to it and when fried add both cashews and raisins in it and fry it till done. 4. 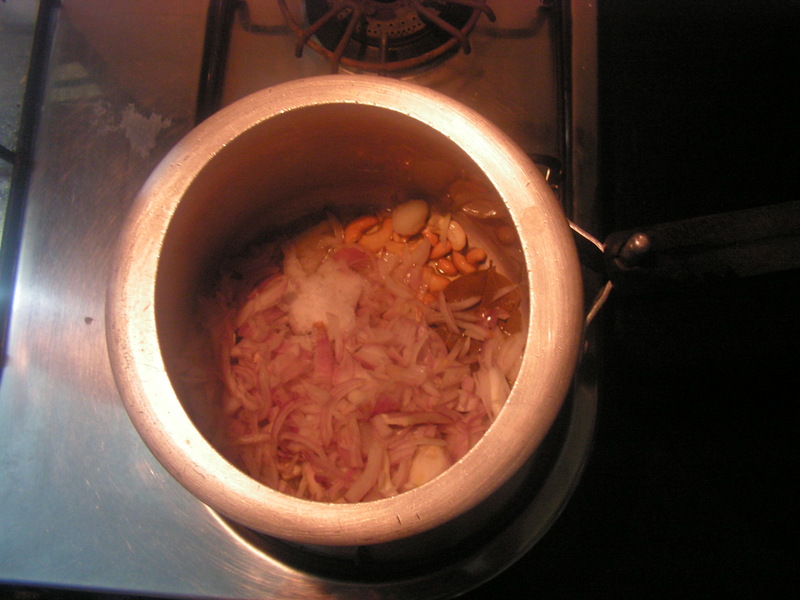 When done add chopped onions from step-2 to it and fry it adding required quantity of salt so that it is not burnt. 5. When fried add chopped bell peppers from step-2 to it and also green peas to it and fry for around 5 minutes on a low flame. 6. When done, add Basmati rice from step-1 to it and just stir in for a while and add required quantity of water to it and check for salt and add half the quantity of pepper powder and cilantro to it and close the cooker lid and cook till done. 7. 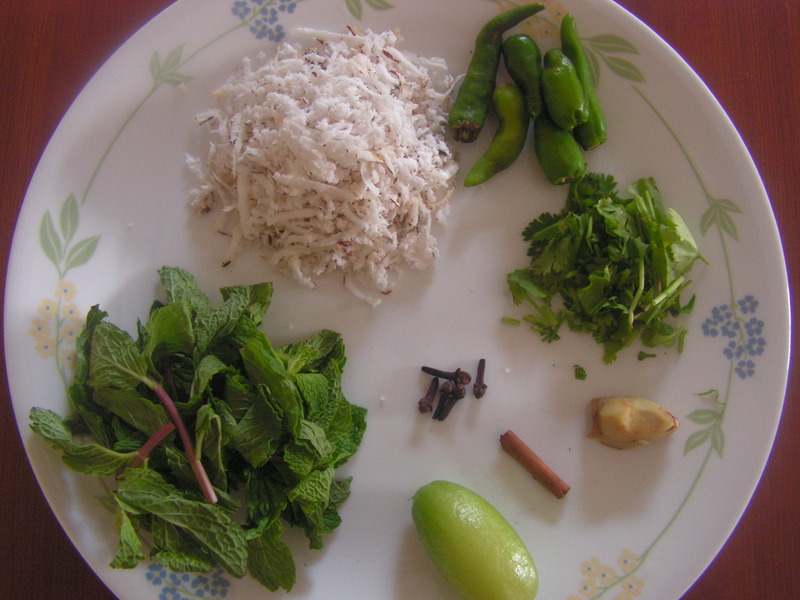 When cooked garnish it with chopped coriander leaves and remaining pepper powder. 8. Enjoy with any spicy dish of your choice like the Veg-kurma, veg-sagu, or even with salad. 1. This dish is served as a non-veg and for which chicken broth should be used. 2. The dish since is bland can be enjoyed with the side dish of your choice. 3. Always cook on low-medium flame to avoid it from burning. 4. One can add green chillies to make the salad spicy. This entry was posted in Uncategorized and tagged 45 minutes, Newbee, One pot meals, Rice items.